Frank Gogos has been researching the Royal Newfoundland Regiment for more two decades. He has published two books on the Regiment’s history and a third on the history of the Monument of Honour. He is currently writing more. He has published and provided articles on the Regiment for the Veteran Magazine, the Legion magazine, The Telegram. He has worked as a consultant to Honour 100, The Rooms and private clients as well as worked on some of Newfoundland and Labrador’s most well known monuments including Newfoundland’s Memorial to the Missing replica plaques in Bowring Park. He has led tours to the battlefields of France, Belgium and Gallipoli. He currently chairs the museum committee. David Mercer is a GIS specialist and Library Assistant in the QEII Library at Memorial University. He is a multitalented individual who is a driving force in MUN’s work in commemorating the history of Newfoundland in the First World War. He is also been a member of the Church Lads’ Brigade for more than 35 years. He has researched the CLB’s role int he First World War and plays a mean tuba in the CLB band. David has also been recognized by Memorial University with The President’s Award for Exceptional Community Service. Anthony McAllister spent more than 20 years as a member of The Royal Newfoundland Regiment where he played the trombone in the regimental band. He was the regimental historian before retiring. 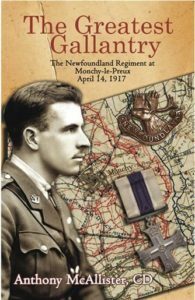 McAllister is the author of The Greatest Gallantry: The Newfoundland Regiment at Monchy-le-Preux. Chris Reid is a doctoral student in history at Memorial University. Chris’ Master’s research resulted in a major research paper titled “Come Follow Me: A Study of Morale, Discipline, and Effectiveness in the Newfoundland Regiment, 1914-1919.” His doctoral research examines soldiers from Newfoundland, Northern Ireland, and the British West Indies during the First World War and how their experiences during the war influenced national identities during the interwar years. He currently serves in the Canadian Forces Reserves.